If you have been reading my blog for a while, you would know that I like making things from scratch. Of course the fanfare comes and goes. i like making my own sausages, until I get sick of eating it and I don’t anymore. I used to make my own chicken nuggets until it got too tedious for me. But for what reasons really? Well, foremost, it is cheaper. Taste-wise, it is actually a tie because it varies from experiment to experiment. Quality, well for sure, mine is not compromised. Those things. But I really am curious in making these things anyway. I wanted to have some Thai red curry, and I wanted to make it from scratch. So I googled some recipes on how to make the paste and found some. I also discovered the basic difference in Thai and Indian curry in the process. I have always thought that the curries of Thailand was mostly herbs and leaves since the green curry was like that, but the yellow and red curries share the same spices such as cumin and coriander. But the main difference is that where the Indian dishes have that as the main component, this is only a partial component for Thai curries. The other half are the greens such as lemongrass, cillantro and fresh chilis. So I bought some of the ingredients I needed and was surprised to find ripe, meaning red, banana (finger) peppers! These are usually green. I have only found ripe ones on a trip to Bicol. But this batch was mostly ripe, and I knew they were perfect for the red pepper paste. I followed the general directions from the different websites. 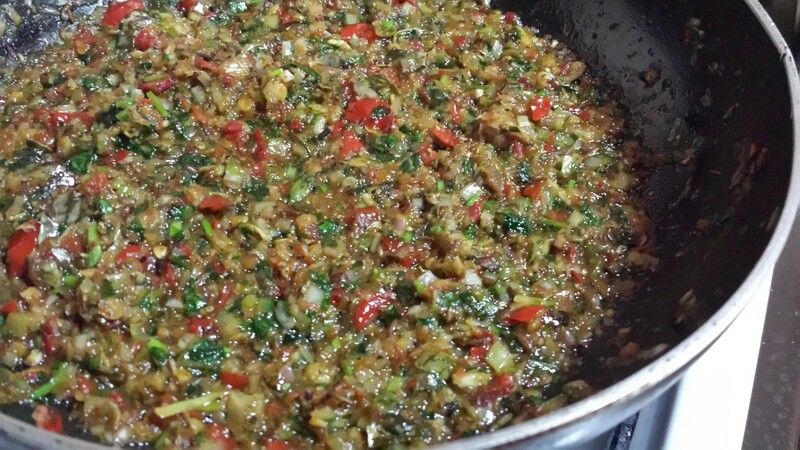 After the grinding and crushing and making it into a paste, I cooked mine by frying it. I was going to store this and not immediately cook with it. I figured that it was better to cook it than store the paste fresh. 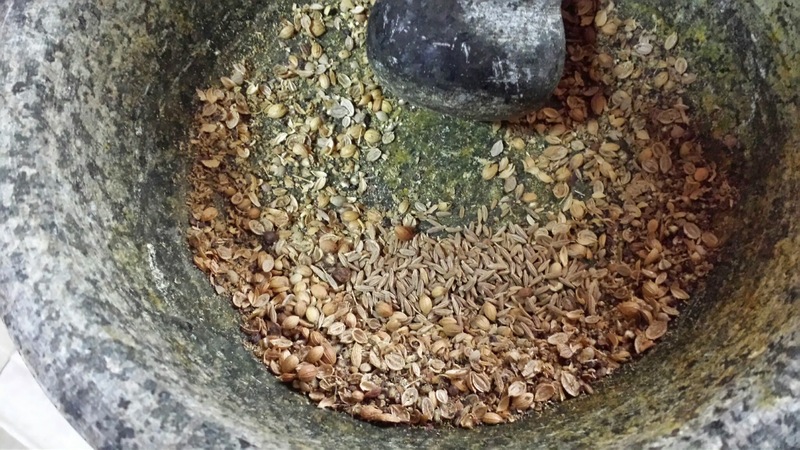 In a mortar (or food processor), ensure all first three ingredients are ground finely. Set aside. 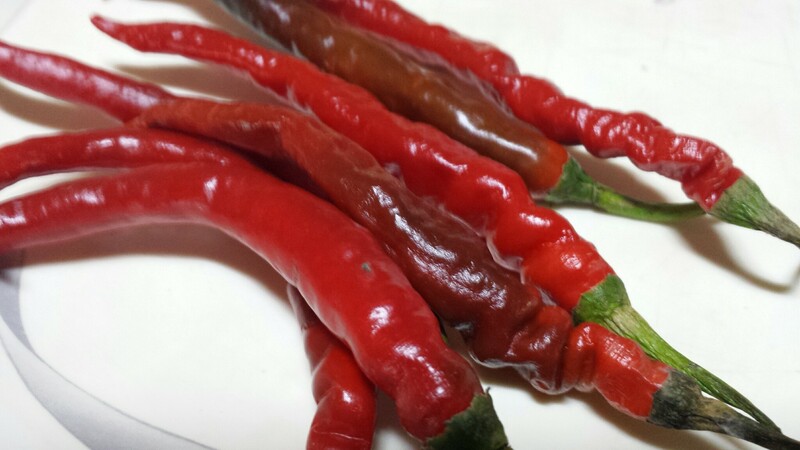 In the same mortar, start with chili peppers and make it into a paste. Make it easier by adding in the salt. Once the ingredient is smashed into a paste, add the next ingredient on the list and beat it into a pulp. Continue until all the ingredients are mixed in. In a pan, put some oil, and fry the paste. Taste. I added a bit more salt to mine but please note that in the actual cooking, you will still add some shrimp paste to the dish (besides the meat, vegetables, coconut milk, etc.). I added a bit of water to mine to loosen the paste up. Store in the fridge and use as needed.